One of the most worrying developments during the trajectory of Syria’s revolution has been the rise of militant Jihadi groups. The danger that the increasing strength of such groups poses to both Syria and the region should not be underestimated. Yet a lot of misunderstandings exist about the nature and dominance of such groups which this article attempts to address. Only when fact is separated from mythology are we able to move forward collectively towards a strategy that addresses the threat of counter-revolutionary forces and have a better understanding of who is working for the original goals of the revolution so that they can be given the solidarity they deserve. Al Qaeda or militant Jihadi groups have an internationalist perspective and want to establish a global Islamic caliphate based on a strict interpretation of Sharia law. The ideology of Al Qaeda groups is closely related to Salafi/Wahabi ideology (the totalitarian political doctrine which is practiced in Saudi Arabia). Whilst Salafism is an extremely repressive, puritanical ideology which follows a literal interpretation of the Quran, it is important to note that not all Salafists believe in violent means to establish their goals and that some Salafists are prepared to work within a democratic system. By contrast, militant Jihadi groups reject the concept of democracy holding that their interpretation of Islam is mandated by God. They believe that it is a religious duty to defend the Muslim community against enemies of Islam and are prepared to die as martyrs for that cause. They regard anyone who does not subscribe to their ideology (including liberal Sunni Muslims and Shia Muslims) as heretics/Kafir. Some, known as Takfiris, believe that they have the right to kill heretics. Al Qaeda affiliated groups in the region include Egyptian Islamic Jihad, Al Qaeda in the Arabian peninsula in Yemen and Saudi Arabia, Jund Ansar Allah in Palestine, Fatah Al Islam in Lebanon and Al Qaeda in the Islamic Maghreb in Algeria and Morocco. These groups do not have a broad popular support base, primarily due to their use of terrorist means targeting civilians in countries in which they operate and their following of an interpretation of Islam which is alien to almost everyone. It is important not to confuse militant Jihadis with mainstream political Islamist groups such as the Muslim Brotherhood. Whilst the Muslim Brotherhood is undoubtably conservative and reactionary, they have broad based popular support across the Middle East and North Africa and have won democratic elections in Palestine, Tunisia and Egypt. They gained prominence during the Islamic revival of the 1970s, as a direct response to western imperialism. They work to reinstate Islamic laws and believe in the concept of Islamic unity and the return of the caliphate abolished by Ataturk in 1924 although they primarily struggle on the national level. They advocate that political Islam is compatible with the establishment of a modern, democratic, multi-party state that respects human rights, including the rights of religious minorities. Pursuing social justice and particularly reducing the gap between rich and poor has been a key tenet of their ideology and to this end they established a vast network of social services which gained them the support of the urban and rural poor. Although they have been known to use violent means to achieve their goals, the Muslim Brotherhood officially rejects the use of violence. The experience of countries that have been governed by the Muslim Brotherhood show a wide gap between their rhetoric and reality. Highly authoritarian and repressive regimes have been established where they have come to power. Yet we should not regard the Muslim Brotherhood as a violent terrorist organization or overlook the support the organization has amongst broad sections of a religiously conservative population. Therefore strategies for dealing with, and opposing, the Muslim Brotherhood should be fundamentally different from our approach to militant-Jihadi groups. The Muslim Brotherhood is prominent in the Syrian National Coalition (the bourgeois opposition in exile which is backed by the West, Gulf States and Turkey and influenced by foreign agendas). The Syrian National Coalition also includes secular and leftist opposition groups (including Christian and Kurdish parties), the Free Syrian Army, grass-roots opposition groups and independents. It advocates establishing a civil, democratic Syria. Between the ‘moderate’ political Islamists and Al Qaeda there exists a broad spectrum of other Salafist groups which subscribe to puritanical versions of Islam some of which are militant. They include Al Nour party in Egypt, Islamic Jihad and Jaysh al Islam in Palestine, and Ansar Al Islam and Ahrar Al Sham in Syria. Further, although the overwhelming majority of people in the region are Muslim, many are also secularists, including the vast majority of Syria’s grassroots civil opposition. Socialist and anti-authoritarian/anarchist currents also exist within Islam with roots that can be traced back to the ninth century. The two Al Qaeda affiliated groups operating in Syria are Jabhat Al Nusra (Al Nusra Front – JAN) and the Islamic State of Iraq and Sham (ISIS). Both can be traced back to groups established to fight against the American occupation of Iraq and grew in strength due to the sponsorship of the Syrian government. This is important to note because whilst the origins of Al Qaeda globally go back to Afghanistan, where they were supported by the CIA to fight against the Soviets in the 70s and 80s, this is not the experience of Al Qaeda groups operating in Syria or Iraq today which fight against US imperialism, Zionism and all western influence. Some of JAN’s members are Syrians that returned from fighting in Iraq when the uprising broke out in 2011, but many foreigners also joined their ranks. Abu Bakr Al Baghdadi, the leader of Al Qaeda in Iraq claimed that JAN was its branch in Syria. However, JAN’s leader, Abu Mohammed Al Golani, has rejected this claim whilst simultaneously pledging allegiance to Al Qaeda globally. ISIS is a part of the Al Qaeda network and the majority of its members are foreigners. Whilst exact numbers are not known it is estimated that together JAN and ISIS have around10,000 members, less than 10 per cent of estimated armed opposition fighters. Both aim to overthrow the government of Bashar Al Assad, establish and Islamic caliphate and a strict interpretation of Islamic law, are opposed to Western intervention and are opposed to the US and Israel. The numbers of JAN and ISIS are relatively small, yet they have a disproportionate strength compared to other armed opposition groups. They have battle-experience from Iraq and have received a lot of military support from Gulf countries, particularly Saudi Arabia and Qatar, which aim to destabilize Syria through sectarian conflict in order to prevent a popular revolution from succeeding. By contrast other armed groups are still mainly dependent on light weapons and what they can seize from Syrian army bases they have captured. JAN and ISIS are concentrated in the north of the country, along the Turkish border in Aleppo and Idlib governorates, in Al Raqqa governorate, and in the east in Deir Al Zour governorate along the border with Iraq. They have attempted to set up Islamic emirates in areas under their control, established Sharia courts and placed restrictions on the rights of women and minorities. Both groups have been responsible for carrying out attacks against civilians, including suicide bombings, the arrest of opposition activists, the torture and extrajudicial killing of Syrian army soldiers they have captured, and sectarian killings. Most recently they have been responsible for atrocities carried out against the Kurdish population, causing over 20,000 Kurds to flee to Iraq in August. The extremism and violence practiced by such groups is an increasing trend and major cause for concern. Yet, it must be borne in mind that the overwhelming majority of the estimated 120,000 deaths and vast majority of cases of torture and brutality in Syria over the past 2.5 years have been carried out by the Syrian regime. 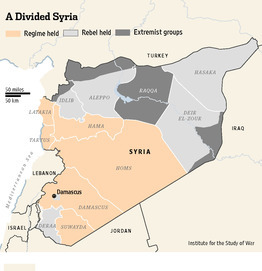 The Free Syrian Army is the main, and by far the largest, armed opposition group in Syria. It’s leadership is linked to the SNC. The FSA is comprised of officers and soldiers that have defected from the regime as well as anti-regime elements of the civilian population. It is committed to the overthrow of Assad and the establishment of a plural, civil, democratic Syria. The FSA is comprised of many battalions. The leader of the FSA, Salmin Idriss has stated he is committed to secularism, yet some battalions are Islamist (mainly Muslim Brotherhood affiliated), some are secular and some are comprised of Christians, Kurds and Alawites. There are even women only brigades. Whilst serious human rights abuses have been carried out by elements of the FSA, these appear to be mainly isolated incidents rather than wide-spread and systematic attacks on civilians and civilian areas. Human Rights Watch has noted that “many of the antigovernment groups reported to be carrying out abuses do not appear to belong to an organized command structure or to be following Syrian National Council orders”. When such incidents have come to light the SNC and FSA have condemned them and called for the arrest and prosecution of those responsible, something that has never been seen from the Assad regime. The FSA is generally held in high regard by the civilian population and seen as protector and defender of the people. ISIS and JAN operate outside of the FSA chain of command and reject the leadership of the SNC. Yet, due to their advanced military capacity and military successes against the Assad regime, some FSA battalions have cooperated with them. The majority refuse to do so, and as militant Jihadi groups have grown in strength and carried out increasing attacks on civilians, particularly sectarian violence, the FSA leadership has sought to distance themselves and condemned their actions. The FSA has also been engaged in fierce battles with JAN and ISIS (as was seen recently in Bustan Al Qasr) and militant Jihadi groups have expelled FSA battalions from some areas under their control and even assassinated FSA leaders. It is also interesting to note, that increasingly JAN and ISIS have refused to fight against the government on front lines and instead focused on consolidating their power in areas under their control. This is a clear testimony that they are not working for the goals of the revolution but rather to further their own extremist religious agenda. There are other battalions that operate outside of the FSA chain of command and are openly critical of the SNC and FSA leadership abroad. These include both secularists and Islamists. One of the largest Islamist coalitions is The Syrian Islamic Front, comprised mainly of Salafist battalions such as Ahrar Al Sham. Their aim is to establish an Islamic state governed by Sharia Law although they are Syrian nationalists and not working for a global caliphate or linked to Al Qaeda. They reject western notions of democracy. When the peaceful popular uprising began in Syria in early 2011, the Syrian government falsely claimed it was fighting Sunni Islamic militant terrorists. This was an attempt to discredit the legitimate demands of the Syrian people for freedom, social justice and dignity and justify its terrifying crackdown. As we have seen, to some extent it was to turn into a self-fulfilling prophecy. The government sent Shabiha (armed Alawite militias) to arrest and shoot protesters and terrorize the civilian population, thereby introducing sectarianism into the uprising, despite minority groups such as Alawite, Christians and Kurds playing an active role in the opposition. In the first five months alone, when protests were still peaceful, the UN estimates that hundreds of people were killed. Many more were imprisoned and brutally tortured. Assad also released a large number of militant Jihadi prisoners from jail in the early days of the revolution. The Assad regime has made deals with Jabhat Al Nusra, such as paying them 150 million Syrian Lira [$1.15 million] monthly to keep oil flowing through two major pipelines in Banias and Latakia. It is also clear that the vast majority of attacks carried out by the regime have not been on JAN or ISIS strongholds but rather in areas where secular or ‘moderate’ Islamist brigades are concentrated such as Homs, Deraa and FSA controlled parts of Aleppo. All these factors point to a concerted strategy by the Syrian regime to allow the uprising to be taken over by Islamic extremism and sectarianism which would allow the regime to gain more popular support. Whilst the focus of this article has been armed groups operating in Syria, it is important to note that the grass roots civilian resistance in Syria remains dynamic and strong and stands against both the Assad regime and counter-revolutionary militant Jihadi groups (and is often highly critical of the SNC leadership in exile). The overwhelming majority of the civil resistance movements are secular, none-affiliated to traditional political ideologies and motivated by desires for freedom, social justice and dignity. Major grass roots opposition groupings such as the Local Coordination Committees have released statements condemning the actions of JAN and ISIS and have stressed that they are committed to a “civil, democratic and pluralist state” that respects the rights of all citizens regardless of religious or ethnic identity. There have been increasing protests against JAN and ISIS particularly in areas where they are dominant, rejecting their authoritarian practices and condemning their sectarian ideology and abuses. For example, in Al Raqqa, the first provincial capital to be liberated from the regime, militant Jihadi groups took over the civilian local council. Where they tried to put up the black Jihadi flag, local activists pulled it down and replaced it with the revolutionary flag. ISIS also tried to impose fasting on the population during the month of Ramadan and have arrested many civilians from the city. The people of Al Raqqa have been holding continuous protests against ISIS and the Islamic court they established, calling on them to leave. Likewise protesters in Idlib and Aleppo have held demonstrations against the Sharia Committee and extremist/Takfiri killings. As sectarianism has increased, there have been protests calling for national unity in which different religious and ethnic groups have participated. On 1 August in Aleppo a joint protest was held by Arabs and Kurds in which hundreds took part, condemning recent atrocities carried out against the Kurdish population by militant Jihadi groups. Civil society organizations such as Nabd have been established to promote co-existence and an end to sectarianism. Likewise, non-violent organizations such as the Freedom Days coalition, which comprises a large number of groups, promote peaceful struggle and coexistence across ethnic and religious lines. In recent days a campaign called Goodbye Da3esh has been established to oppose the wide-spread arrests of civilians, including opposition activists, carried out by ISIS. Such initiatives and struggles need to be highlighted and supported. It is too easy to adopt the simplistic binary narrative promoted by states and blanket thinkers that the choice the Syrian people face is between a secular fascist dictatorship or Al Qaeda. As Spanish revolutionaries in the 1930s fought on two fronts against both the fascists and the communists, Syrian revolutionaries have to fight against both the Assad regime and counter-revolutionary militant Jihadi groups. It is clear that militant Jihadism is gaining a foothold in Syria and that as the struggle continues without resolution they will continue to grow in strength. The answer is not to support a regime that holds responsibility for creating this problem in the first place. The answer is to stand in solidarity with those who struggle against it, in the hope that their voices will not be lost for ever. 1 I emphasis the word militant because the concept of Jihad is often misunderstood. Jihad is a religious duty for Muslims and means “struggle”. This can be interpreted as a struggle against oppression or the internal struggles of ones own personal life. In the contemporary use Jihad(i) refers to those who find it a religious obligation to defend Muslim land against the Kafir (non believer). 13 This is evident in chants of support for the FSA seen at weekly protests across Syria and also based on my own discussion with Syrian refugees in camps across Lebanon and Jordan. 22 Syrian Freedom Forever, ‘Syria or elsewhere, there are no pure revolutions, just revolutions,’ http://syriafreedomforever.wordpress.com/2013/06/07/syriaor-elsewhere-there-are-no-pure-revolutions-just-revolutions/ also Yasser Munif ‘The revolution and the war’, http://socialistworker.org/2013/09/11/the-revolution-and-the-war. The conversion is based on exchange rate of 11 September 2013. Posted on September 12, 2013, in Middle East and tagged Islamists, Syria, syrian revolution. Bookmark the permalink. 13 Comments. MB party is a political face of Al-Qaeda . and this party is banned in syria since 1970 , because it’s created by UK . don’t try to wash thier criminal history , we are educated , don’t write again any article for idiots , respect your readers minds , get a life , breath , we are human and knew the history more than you . All political parties that are not part of government were banned in Syria, that is what a dictatorship is, and the Muslim Brotherhood was founded in Egypt in 1928 by Hassan Al Banna. Whilst the article attempts to clear up misunderstandings about the relationship between Al Qaeda and the Muslim Brotherhood, it also clearly states that the Muslim Brotherhood is in no way desirable and that strategies should be developed for opposing them. The article instead calls for support to grass roots civil resistance initiatives which are non party affiliated and non religious and stand against sectarianism and religious extremism. Thanks for this well-written article which sheds some light on the complex nature of the Syrian resistance and dispels some important misconceptions. The only way to defeat Al-Qaeda in Syria is to arm the Free Syrian Army to the hilt. The best way to assure Al-Qaeda’s victory is to deny them arms as Western anti-interventionists like Phyllis Bennis and Rania Masri recommend.